The ACID ALKALINE BALANCE DIET is the Perfect Way to Restore your Health & Enhance your Energy. 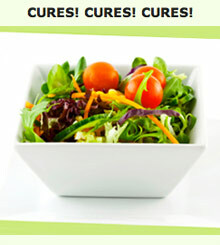 Let Thy Food Be Thy Cure! Foods are classified as acid-forming or alkalizing depending on the effect they have on the body. Acid-forming diets lead to acid indigestion that eventually creates a condition known as chronic acidosis which acidifies body tissue. This acidification process chokes off oxygen within cells and eventually compromises the immune system. This leads to all sorts of diseases such as cancer, heart disease, stroke, memory loss, nutrient deficiencies and poor athletic performance. All of these conditions are, for the most part, due to acid-forming diets that violate the acid/alkaline blood ratios of your body cells. One of the keys to cancer prevention is eating an anti-cancer diet, also referred to as the Acid Alkaline Diet. 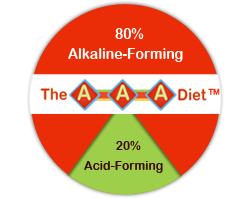 The AAA Diet® is the only high alkaline diet that can alkalize and oxygenate body cells as you eat alkaline foods according to the acid alkaline food chart. The typical American diet is too high in acid-producing foods like meat, eggs, dairy, white flour and sugar. By following The AAA Diet® instead, you will begin cleansing your body by flushing out acidic wastes caused by poor diet, environmental toxins, stress, drugs and other destructive substances. You will learn to make healthy and delicious alkaline diet recipes that include high alkaline foods such as green vegetables, fruits and nuts from the alkaline foods list. You will also learn proper food-combining principles to aid digestion. By following a specific alkaline diet plan, you will begin to shift your body's pH and oxygenate your body. These alkaline foods will keep your body healthy and functioning correctly to help prevent and combat diseases such as cancer.